As The Spook School reveal a new video for Speak When You’re Spoken To and a raft of live dates including Liverpool Sound City, Getintothis’ Jake Marley finds the Edinburgh quartet at the top of their game. The Spook School, fresh from a triumphant showing at SXSW, have unveiled a new video for Speak When You’re Spoken To, taken from Try To Be Hopeful, their MJ of Hookworms produced follow up to critically acclaimed debut Dress Up. Speak When You’re Spoken To in spoof video form is a galaxy away from the scuzzy noise-pop soundtrack that accompanies it and features the band prancing around with friends and supporters acting like domestic pets. The Spook School are among the new additions to Liverpool Sound City Festival, you can see the full list of additions and listen to our handy playlist here. In support of their new video and album, the band have announced a wave of live dates. 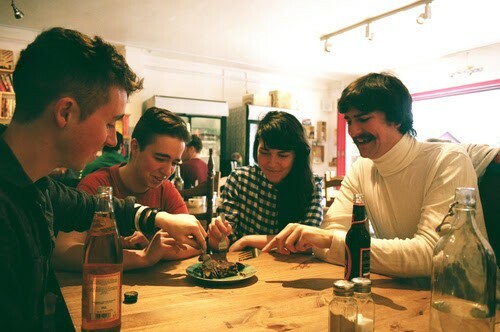 Capping off their Spring with a slot at Liverpool Sound City Festival, before supporting Fat Cat Records’ alt-rockers PAWS on a lengthy summer jaunt, also stopping off in Liverpool, at Studio 2 in June. Two great opportunities to see a band growing up, honing their sound and sure to be at the top of their game this festival season, you’d be a fool to miss out. You can view the video for Speak When You’re Spoken To below via Fortuna POP!